A graduate of the Kentucky Military Institute with the "Hollywood" tag, an image he never liked, Danny Sullivan is the son of a building contractor from Louisville, Kentucky. This popular American who celebrates the big 5-0 this millennial year, started out as many other fellow European and Latin American drivers: at the famous Jim Russell Racing School, based at Snetterton back in 1971. Untypically, Danny's career began in England and he never drove ovals until joining the CART scene in 1982! Back to the early years, he drove a season of Formula Fords in 1972. In 1974 he distinguished himself by never finishing worse than third in a total of 12 F3 races while for the rest of the decade he spent climbing the career ladder from F3 to F2 and Formula Atlantic. For 1980 he moved on to the SCCA Can-Am single-seater sportscar series, a career path many drivers explored during the late 1970s. The cars were similar to many Interserie cars of the 1990s: in effect a single-seater formula car with the wheels covered. The cars were generally sportscar-bodied Formula 5000 cars. Notable drivers included Keke Rosberg and Patrick Tambay. Danny finished 6th overall in the final standings and was named Can-Am Rookie of the Year in 1980. He continued in Can-Am for 1981-'82 when he took his first win at the Las Vegas race on the Caesar's Palace parking lot in the 1981 season finale and finished fourth in the overall standings. In the 1982 series Danny finished 3rd overall while again winning the Las Vegas round of the championship. Now he was driving for the Budweiser-sponsored Paul Newman team. As he gained in reputation, also in 1982 Danny made his Indycar debut when he joined the Forsythe-Brown team. (Alongside team owner Forsythe, co-owner Garvin Brown was the owner of the famous Tennessee-based bourbon maker Jack Daniels.) Remarkably, Danny made it to the podium with a record third-overall finish in his first ever CART race at Atlanta. He then also did his first Indy 500 race, sadly wiping out his Cosworth-powered March 82C on the 148th lap when he hit the outside retaining wall. In 1983, Danny suddenly found himself in Grand Prix racing but at the season came to a close he was out again. 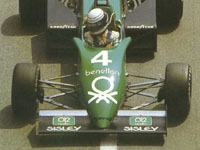 At the wheel of the second Benetton-backed Tyrrell, Sullivan never achieved much success in the world's top series, his best performance coming in the non-championship Race of Champions. His dice with World Champion Keke Rosberg, the two touching each other more than once was a thrill to watch and marked the highlight of Danny's Formula One career. Apart from that remarkable performance, a fifth at Monaco gained him two World Championship points, his normally-aspirated Tyrrell 011 less handicapped on the street track against the growing numbers of turbo cars. He would now rejoin CART and would remain there for the rest of his career. In semi-retirement he made a few appearances in sportscars towards the end of the 1990s. With Team Shierson for 1984, he was an immediate hit in the Domino Pizza car. Driving a Lola T800 he won at Cleveland, Pocono and Montreal. This attracted the attention of Roger Penske who had no doubt in signing him for 1985, putting him behind the wheel of a Miller-sponsored March 85C. This was the year he made his famous "spin-and-win" at the Indy 500 when while leading he lost his car on lap 120 and did a full 360 - actually it was a 400-degree spin. He was lucky not to hit anything and was able to continue. The engine almost stalled during the spin but he managed to get it going again. After pitting for fresh tires he dropped to second and found that the car was handling better than before his spin! He regained his lead on lap 140. Danny had turned into a superstar of American racing. He appeared in talkshows and also guest-starred in a episode of Miami Vice, which made Danny an instant celebrity outside the motorsport arena. Sullivan would remain with Penske for six years until the end of the 1990 season. It proved to be a successful cooperation as he added 12 more wins to his first-season tally of 3. His best year was 1988 when at 38 he was crowned CART champion. Four wins and a host of poles proved he was the fastest man around in 1988. That year he was also signed by the crack TWR Silk Cut Jaguar sportscar team for their Le Mans effort that year. Driving a XJR9LM with fellow Americans Davy Jones and Price Cobb he finished a lowly 16th after hitting trouble along the way. A high-profile signing with the Miller-sponsored Pat Patrick Racing team in 1991 to drive the Alfa-powered March proved unfruitful but in his forties he continued to win while driving for other teams. He never again challenged for the title but was quick enough on his day to rack up a few more wins. For Galles Kraco, at the age of 42, Danny won the Long Beach race in 1992 and finished third in Toronto, the year spent in the unusual Galmer G92. His final win came the following year when still driving for Rick Galles he won the Detroit event. His career now winding down, Sullivan was forced to take a one-year sabbatical from CART, spending a 1994 season back in Europe driving an Alfa 155 V6 TS in the German Touring Car Championship. He also competed in the inaugural Brickyard 400. Then, late-season testing for PacWest led to contract with them for 1995. So at 45 he finished his single-seater career with a season in a Ford-powered PacWest Reynard 95I. His best result came in Surfers Paradise, taking a fifth. In semi-retirement he then drove a McLaren F1 GTR at Le Mans together with Johnny Cecotto and Nelson Piquet in 1996 before last being seen in a racecar in 1998, finishing a tremendous second at the Daytona 24 Hrs in Porsche 911 GT1 Evo shared with Allan McNish, Jörg Müller and Uwe Alzen. He also adds colour to television broadcasts these days and enjoys swimming, skiing, snowmobiling, tennis and racquetball. With the exception of Jacques Villeneuve Jr and Mario Andretti, Indy car drivers have become notorious in F1 circles for their blatant inability to impress in Formula One despite whatever success they may have had across the Atlantic. The sad, at times laughable stories of Michael Andretti and Alex Zanardi have been well documented, but they were not the first. While the name Danny Sullivan ranks with the Andrettis and Zanardis of this world in terms of Indy success, he too was equally below par in Grand Prix racing. So much so that hardly anyone remembers that he spent 1983 trundling around in one of Ken Tyrrell's reasonably competitive machines, with a conspicuous lack of success compared to team-mate Michele Alboreto. Sullivan, the son of a general contractor from Louisville, Kentucky, originally studied business at University before heading to the Big Apple. There he struggled to support himself and he spent his teens working variously as a janitor, cab driver, waiter, lumberjack, sod cutter and chicken ranch hand. Come his 21st birthday, however, that all changed, when Dr Frank Faulkner paid his tuition fees to attend the famous Jim Russell School of Motor Racing in England. A year later, he made his debut in British FF1600, and for the next few years continued to race in junior categories. In 1974 he was 2nd in the British F2 championship and 4th in the European F3 championship. In 1975, he took 5 wins and 4 poles in F3, which facilitated a move up to European F2 in 1976. But unable to climb any higher, in 1978 he took a path well-trodden at the time, moving to New Zealand to compete in Formula Atlantic, in which he merely came 4th overall. He also dabbled in Formula Atlantic in America that year, coming 8th. His single-seater career almost at a dead end, he returned to the USA full time, working as an instructor with Skip Barbers. His career got moving again when he linked up with affluent Jack Daniels heir Garvin Brown - together they formed a team with whom Sullivan competed in Can-Am, in addition to his US F.Atlantic regimen. He made a good impression there in 1980 using an old Lola, coming 6th overall. He improved to 4th the next year, driving the oddly-named Frissbee, including a victory at Las Vegas. He was to win there again in 1982, and with his form in Can-Am and F. Atlantic well-established now, he landed an Indy car debut for the Forsythe-Newman team at Atlanta, which netted him a fine podium finish. His debut at the Indianapolis 500 wasn't as glorious, ending ignominiously against the turn 4 wall after 148 laps. Unable to keep his Indy drive because of a lack of funds, his drive went to the opulent Hector Rebaque, and he went back to Can-Am where he took his March to 3rd in the series. But for 1983, when the F1 season got under way in Brazil, Sullivan was a surprise inclusion in the Tyrrell line-up, alongside an in-form Alboreto, fresh from victory in Las Vegas the previous year. Despite only using a modified version of the 1982 011 chassis, the team had reason to be confident, especially with significant new backing from Benetton, making their landmark entry into F1. For Sullivan, it was to prove an inauspicious debut in Rio, qualifying 21st and finishing a lap down in 11th, while there was drama at the head of the field. Brazilian legend Nelson Piquet recorded a great home victory to start the season - but only after defending World Champion Keke Rosberg was leading handsomely when he came in for a routine fuel stop, only to have fuel splash out and ignite a flash fire. Rosberg did the instinctive thing and jumped out, only to be ordered back in by an unimpressed Patrick Head. Given a push start, he was on his merry way again, charging back through the field to finish 2nd, but for his outside assistance he was disqualified after the race, even though those behind him were not promoted. Compared to Alboreto, Sullivan's qualifying performances for the rest of the season were OK, but rarely did he crack the top 20. The three occasions when he did were when he qualified 19th in South Africa, and, on home soil, when he started 16th at Detroit and a marvellous 9th at Long Beach, where experience on that track obviously helped. Otherwise his performances in practice or on Sundays had little to recommend them, but in truth it was a fairly eventful season. He suffered everything from clutch failures to electrical gremlins, engine failures, fuel pump problems, and broken fuel lines which caused a fire at Brands Hatch. Add to that a spin at Imola and a multiple collision in Austria at the first corner, and Sullivan only managed to reach the finish on 8 occasions. On one of these he was later disqualified, when his car was found to be underweight at Montreal having finished 9th on the road. Apart from that, highlights would have included an 8th place at Long Beach, 7th at Kyalami, and a credible 5th at Monaco, where he finished 2 laps down. Those two points would be the only ones he would score in his World Championship Grand Prix career. It earned him 17th in the 1983 World Drivers' Championship. Alboreto, meanwhile, had not done a great deal better, but he did add a fine win at Detroit to a 6th place at Zandvoort. For Sullivan, though, the Race of Champions at Brands Hatch was a different matter altogether. Briefly leading the race at one point, he finished a very close 2nd to Keke Rosberg in a fine performance. However, it was not enough to save his seat at Tyrrell. With Alboreto shifting to greener pastures at Ferrari for 1984, Ken Tyrrell went for the latent talents of Stefan Bellof and Martin Brundle, and Danny Sullivan found himself on the outer, and back across the Atlantic. In 1984, he landed a full season drive for the Domino's Pizza Team Shierson Indy car outfit, and won at Cleveland, in Montreal and at the Pocono 500. A string of top ten finishes meant he came an excellent 4th overall, and his failed time in Europe was quickly forgotten. 1985 saw him joining Roger Penske's team (on the strength of his Pocono drive), and apart from victory at Miami, Sullivan famously won the "Spin and Win" Indy 500. Battling with Mario Andretti, he took the lead and proceeded almost immediately to do a full 370-degree spin at turn two, from which he was able to miraculously recover. Pitting for fresh tyres under the yellows his spin had brought out, he fought his way back up, challenged Andretti for the lead again, took it, and went on to record one of the most memorable Indy victories ever. His remarkable recovery earned him a place in American racing parlance; a spin followed by a similar save has become known as 'a Danny'. 3rd in the PPG points in 1986 came with the help of two wins, but in that year he went in the reverse direction as Paul Newman and took up acting. Through influential ex-Can-Am partner Brown, he met Michael Mann, producer of "Miami Vice" who offered Sullivan a guest spot on the popular TV show. Sure enough in February Danny made his debut in episode 38, entitled 'Florence, Italy' in which he played a grand-prix racer suspected of murdering a prostitute. This led to more lights, camera and action, including a role on "All My Children", and appearances in several fashion magazine layouts. Perhaps this diverted his attention so much that in 1987, he failed to record a single win or pole position, and only came 9th overall. Getting his priorities right in 1988, he gave Hollywood the flick and bounced back to win his first PPG Indy Car World Series title, with 4 wins and 9 poles in a totally dominant season. In 15 races, he recorded 11 top 5 finishes and 182 points. But his roller coaster career continued into 1989, when he broke his arm at Indianapolis, but nonetheless qualified 26th and battled on before axle problems struck. Throughout the rest of the season, he took two more wins to come 7th overall. He also raced in IROC that year with some success, winning at Nazareth. 1990 was his last year with Penske, taking another two wins and coming 6th in the series - although it did provide other highlights, such as the birth of his son, Daniel O'Driscoll in March. He signed off his time with Penske with a win at Laguna Seca, before joining Patrick Racing in an Alfa Romeo with Miller sponsorship for 1991. An encouraging 4th at Surfers Paradise was unindicative of an utterly disappointing season, which eventually saw him leave to join Rick Galles' team for 1992, running the unique Galmer chassis. This move would bring some improvement, but only one win, and 7th overall in the points standings. One more win in 1993 could only help him to 12th overall, but it would be his last in Indy car racing. Out of a drive in 1994, he dabbled in the two rounds of the German Touring Car Championship held outside Germany at Donington and Mugello, and tried his hand at Nascar in the Brickyard 400. He also recorded his best performance at Le Mans (having driven there for many years previously), coming 3rd with Thierry Boutsen and Hans Stuck Jr in a Dauer Porsche. But a good test with the PacWest team in mid-year saw him thrown a lifeline, and in 1995 he returned to Indy cars, but it was not a happy year. A nasty crash at Michigan ended his season and left him with a broken pelvis. As a result, he retired from competitive racing, and took up commentary, a pursuit he has continued successfully to this day. He has made fleeting returns, though, coming 8th at Le Mans in 1996 with Johnny Cecotto and 3-time WDC Nelson Piquet in a McLaren F1 GTR, and 2nd in the Daytona 24hrs race in 1998 in a Porsche with Allan McNish, Jorg Muller and Uwe Alzen. In the 1999 American Le Mans Series, as well as being Assistant Clerk of the Course at several races, he was also entered to race in a number events in the series driving a Multimatic Lola with Scott Maxwell and Harri Toivonen, but was a no-show. Instead, he turned up this year at Goodwood, where he drove a Tyrrell 019, and a Honda-powered car shared with Damon Hill.